*Please be sure Cookies are Enabled in your browser and that you are not using a Private Browser Mode when registering a card or logging into your Perk Card account. 1. 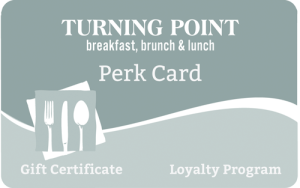 Purchase your card today at any Turning Point Restaurant for $10 and that $10 value is loaded directly onto the card. 1. Get a free entree for your birthday when you dine during your birth month. (up to a $15 value). 4. Receive random acts of kindness from your favorite breakfast and lunch restaurant…you never know what we might do! 5. Receive email updates on special events and information about new Turning Point openings. *We respect your privacy and will never rent or sell your information. By providing your email address you are opting in to receive email from our company and you may ask to stop receiving email from us at any time, if we become annoying. **Perk Cards can also be used as a gift card and you can check your balance here at anytime. Q: Can I add value to my card online? Q: If I receive a gift card, and I register it as a Perk Card, when will the $10 value be added to the card? A: There is no additional $10 value added to the card. If you purchase it as a Perk card for $10, that money is put right onto the card as value. If you receive a gift card for $10 or more, you have the option to register it online as a Perk card. Q: Where can I sign up for the birthday coupon? A. We discontinued the birthday coupons but we replaced it with the Perk Card Program. When you sign up for a Perk Card you will receive a complimentary entrée during your birth month. Q: It’s my birthday this month and I don’t see the $15 added onto my card? A: When you come in to eat at any Turning Point during your birth month when we swipe you Perk Cardan entrée will be taken off of your bill. Q: When I signed up I was told that I would pay $10 and an extra $10 would be added onto my PerkCard. A: When you sign up for the Perk Card you pay $10 to register the card and that same $10 is added onto your Perk Card as value. Q: When I register my Perk Card online it keeps asking for my Perk Card number. A: When you register the card online it will ask for your card number (it begins with 20509) twice, then it will ask for your ePin (located on the right side of the back of the card). Q: When I login with my card online it says “Aloha Store Value Transactions”. A: The Aloha Stored Value Transactions list where and when you have eaten at a Turning Point along with how much your meal was and the balance of your card after the meal. A: Yes. When you log in online at the top right it says “Edit Profile”, this is where you can change any of your information. Q: If I lose my card and get a replacement, will I be able to transfer my account history to the new card? Q: How do I Get a Replacement Card? A: Please contact corporate here. Make sure to give your full name, email address and mailing address where you want the new card sent.